Update, October 3: Fortnite’s Freeze Traps, known as ‘Chillers’, go live today. Fortnite has its first new item of Season 6, as the Chiller – the real name for what will probably continue to be known as the Freeze Trap – arrives in the game with the latest patch. Fortnite’s v6.0.1 update will drop this morning, adding the new traps to the game. We originally thought that the Chiller would deal a small amount of damage and slow enemies, but Epic’s official patch notes seem to refute those claims. Instead, they say that the new trap “Applies icy feet to friends or foes, causing them to slide around with low friction. That doesn’t mention any damage being dealt by the trap, nor does it sound like it’ll slow people down. Instead, it might even speed players up, as they slide around with their icy feet – although they’ll obviously have minimal control over their direction. 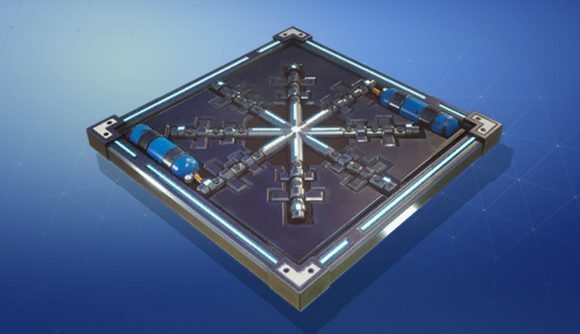 The traps are a Common drop, and you’ll be able to find them all across the map – everywhere from floor loot to Supply Drops – so expect to see them pretty regularly over the next few days. Freeze Traps are already part of Fortnite in the game’s original Save the World configuration, and they’ll likely have a similar appearance in Battle Royale. In the PvE mode, they freeze enemies in place altogether – but that’s likely a step too far for PvP. Other recent leaks have revealed a Capture the Flag mode and Oktoberfest skins – the latter are already in the item shop. We’ll see how soon Freeze Traps follow suit as more updates hit the new season. Elsewhere in the Fortnite v6.0.1 patch notes, there are some changes to Playground mode. Those will give you more control, letting you change things like time of day and even gravity levels while you and your friends play around.